When it comes to taking a break from the hectic schedule of day to day life, a vacation becomes evident. There are many places that are season specific when it comes to vacationing. However, you might not be free to visit a place that is open to the tourists at a specific time of the year. Thus, you must keep track of those places that are equally gorgeous all-round the year and are also convenient to visit. Some of these places lie in the heart of the Himalayas in India,witness a high influx of tourists. Hence, one of the reasons why the Shimla Kullu Manali tour package is so popular among both the Indian and international tourists. Before you book the package of your choice, you must take a look at this insider’s travel guide so that your trip turns out to be comfortable enough. Convenient Commute: Even though Manali is located at high altitudes, the transportation system is quite good From highways to railways and air routes, every mode of transport can be used to reach the place. If you are the person who enjoys being a class apart, you should definitely travel on the Kalka-Shimla Railway. This train route, started by the British in 1898, is a UNESCO World Heritage Site. Thus, you can perceive that getting the tickets won’t be easy if you do not plan your trip well in advance. Satisfactory Stays: When it comes to accommodation, you will come across plenty of places to stay. What matters the most, in this case, is your budget. Manali has some excellent resorts ranging from 4 stars to 5 stars! They are pricey but are worth the money spent. There are also home stays and affordable hotels in and around the centre of this town. Hotels are much cheaper in Kullu, which is quite close to Manali, and getting the room of your choice isn’t an issue. However, you need to keep this in mind that if you visit Manali and the adjoining places during the peak season, you will be in trouble if you don’t book your stay in advance. Fantastic Food:Food from different cultures from all over India has infiltrated Manali. Thus, at present, finding your favourite cuisine to fill your stomach while taking a look at the breathtaking surroundings won’t be an issue. Owing to the increase in the number of international tourists, plenty of restaurants have been coming up of late that service their customers by giving them a taste of every cuisine from all over the world. Nevertheless, you must try out the local momos (dumplings), noodles, parathas, and moreif you are a lover of Indian and oriental cuisine. The local spices will surely get your tongue dripping. Tremendous Tourist Places: Manali boasts of excellent views of the snow-clad peaks of the mighty Himalayas. As Manali is a congested town compared to the surrounding hill stations, people love to go to other nearby places that are less crowded but equally beautiful. Out of all, Solan Valley, Rohtang Pass, Dharamshala, Kullu, Gulbarga, and others are the favourites. 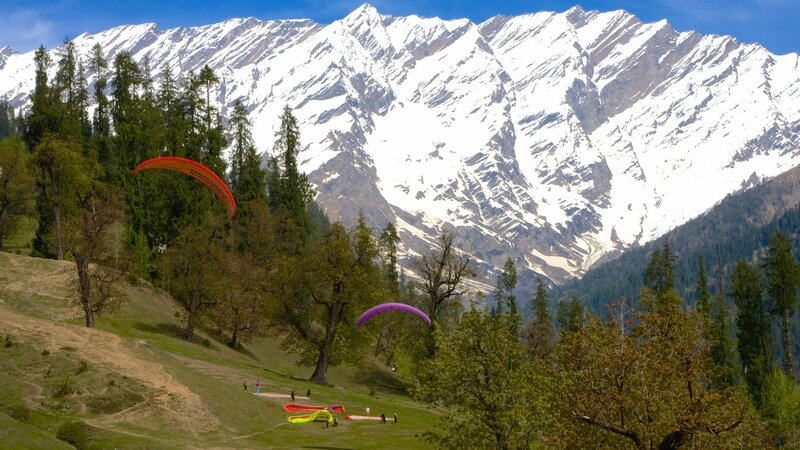 Apart from its natural beauty, Manali is also the paradise for people who love adventure sports. Rock climbing, trekking, hiking, river rafting, skiing, paragliding, and others are always booming with tourists who love to feel the adrenaline rush. Packing the Right Clothes: The type of clothes that you should pack depends on the season in which you are visiting Manali. In winter, you must fill your luggage with sufficient warm clothes. Carry a waterproof jacket too to have fun in the snow especially during a snowfall. If you are visiting in summer, full-sleeved t-shirts during the day and a sweatshirt at night will be sufficient. If you keep this guide in mind, your Shimla-Kulu-Manali tour package will be utilised successfully. Book your tickets, pack your bag, and get ready to enjoy the best trip ever.